Did you know that adults as well as younger people can benefit from seeing a McMurray orthodontist? It’s true. Modern tooth alignment therapy is gentle, effective, and affordable. There’s no reason why your age should prevent you from getting the help you need. Most of us spend our lives guided by what’s called “common knowledge.” We accept that what most people believe is probably correct – and that’s probably true in many cases. “Braces in McMurray are just for kids.” In reality, people of any age can benefit from alignment therapy. If you’re an adult suffering from underbite, overbite, or similar issues, then your dentist has options that may help. “Braces just aren’t practical for adults.” The truth is that modern clear braces are not only practical, they’re also comfortable. They’re made from a transparent acrylic material that’s almost invisible to observers. Plus, the wearer can remove the appliance to eat or tend to other personal tasks. “Misaligned teeth are no big deal for adults.” This is perhaps the most harmful of these three misconceptions. Millions of adults are suffering from headaches, back or neck pain, and poor dental hygiene. Many of these people stand to benefit from modern alignment therapy. Only a dentist can say for sure. Quick results. Simpli5 therapy typically takes only 3-5 months to complete, far shorter than with other choices. Greater convenience. 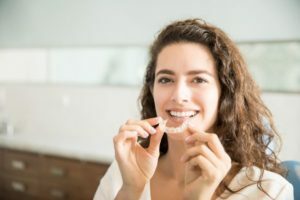 The patient wears each set of aligners for 3-4 weeks, compared to approaches that require a new set every 10 days to two weeks. Enhanced comfort. Simpli5 aligners require no metal wires or other impediments associated with traditional braces. Less cost. Simpli5 is up to 20% less expensive than other adult alignment treatments on the market. Simpli5 aligners require only minimal care. Your dentist will probably recommend that you rinse the appliance a few times a day to remove food particles and other foreign matter. Plain tap water work just fine for this purpose. You should keep the product away from heat sources and direct sunlight and store it in its compact carrying case when not in use. It’s important to see your dentist every six weeks or so for a brief visit so he or she can check on the progress you’re making. Simpli5 is best suited to patients with mild cases of misalignment. Your dentist may recommend another approach if your condition warrants it. Make an appointment with your local orthodontist to discuss your treatment options. You’ll soon have a brighter, healthier smile to share with the world. Dr. Gary Cartwright has been caring for patients here in Southwestern Pennsylvania for over 20 years. Dr. Cartwright earned his DDS degree from the University of Pittsburgh. He also holds a degree in orthodontic dentistry from the University of New York at Stony Brook. You can reach his office online or by calling (724) 942-5130.